The C7082 time card is our best selling time card, the C7082 weekly card is compatible with a large range of Time Recorders and Clocking Machines. The C7082 time card is our most popular, it is commonly used by most time recorder manufacturers and time recorder suppliers. 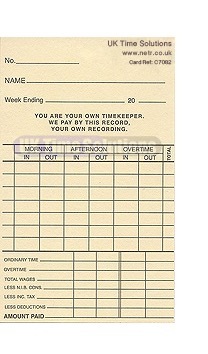 Our comprehensive selection of timecards includes many types of cards featuring weekly used cards, monthly use cards and barcoded pre-programmed calculating clock cards, job timing cards, plastic time & attendance fob and cards, workshop technicians 3 part job tickets. We can also provide bespoke specially printed cards to your own design and specification, please call for details.